There are some questions about Sibo we get asked all the time. We made a blogpost for you where we passed on the top 5 questions to Sibo’s coach Alister. If there are more things you want to know – give us a shout and we try to answer them in another blogpost. Why do you support Sibo and not somebody else? When I was a kid I always looked at everyone around who had things and I wished I as fortunate. It took me the best of 10 years to become fortunate. Once I was able to know I could make a difference to others I chose groups of people/companies and affiliates Internatioanlly which gave me much pleasure. The strange thing is I get as much pleasure now just helping once person as I did the entire world. I guess it’s because it comes from a place you could call love for your fellow Human Beign. There are so many good and fast runners – why do you think he can succeed? I am merely a channel for his expression and he keeps wanting to try. I guess it’s not the one who is the most talented but it’s the one who wants to win the most takes the podium. I see raw talent in him that I did not have. I guess if I had half the talent that he had I know I could have gone so much further in my running carreer. Is he talented enough to make a professional career in trail running? I think one needs to have a certain amount of talent, charm, focus and basic old hard work. I think it pretty much needs to be a way of life you know. I did it for a small period of 3 years full time and it was so much dedication daily so I know it can be done. I guess it comes down to how badly you want it and what are you prepared to sacrifice. Family time? security? Friends? If you ask me if he is more talented than me as a trail runner, sure he could be. He is currently living the life of a road runner passionately surrounding himeself with Athletes daily. It’s just a matter of time when he finds the key to unlock his potential. 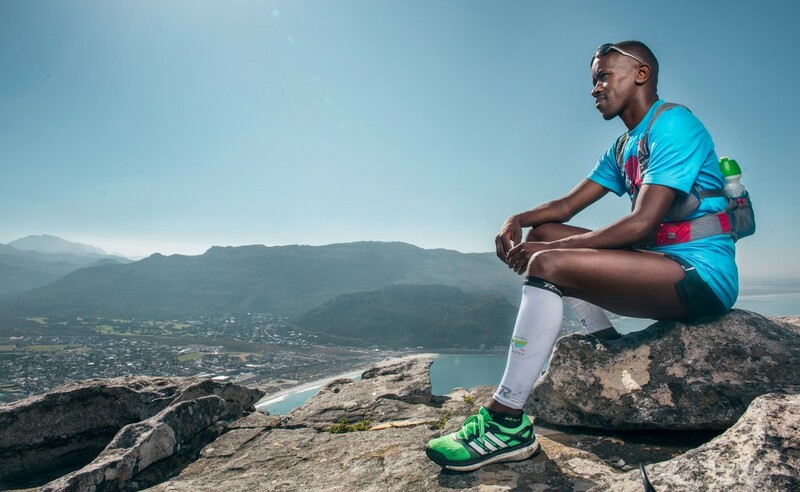 At the end of the day – South Africa has not seen many Trail runners from Eastern Cape make it in the world . Is he not too old? Most runners doing ultra distances only start peaking in there 30’s. What are we talking about is not on a European standard of living it’s a basic level of life improvement. This is a frustrating question to answer when you have basic needs like runing water, safety, food,transport, health that we are hoping to improve someones life and not just his, but the next generation. Do you even imagine the people arround him that are looking up to Sibo now as a role model just because he is affiliated to Bloodsister and has received basic attention in the media. SIBO is a success he is the change that he wants to be. Others just talk and he is trying. I rather be supporting his dream for 10 years than be arround side line talkers. How long do you think he will need to reach the level of a top athlete? Sibo is a top Athlete. He just needs to believe and work harder. What he needs is to paint on a different canvass to shine. Once you put someone into a different environment they blossom. I am a result of that very experiment. I know from my own experience I did it in 2 years. But it could take 1 year or 6 years everyone has a different learning curve.